Last year at Baselworld, Alpina took the covers off of the AlpinerX sporty hybrid smartwatch, and revealed the slightly-odd tactic of taking the watch to Kickstarter in order to ask backers to help shape the design and specs of the final version. 12 months and 3,000 backers later, and the official 2019 retail line-up of the AlpinerX has been unveiled at Baselworld 2019; with the four most popular design choices – from a staggering 11,000 combinations Kickstarter backers were able to configure – hitting the shops in April. We got hands on with the four new models at the big Swiss watch fair – along with a couple of limited edition models to find out what the watchmaker has in store for us with its new hybrid. Unlike traditional hybrids that usually embrace a dial to indicate a user’s progress towards an activity dial, the AlpinerX has an info heavy-packed display with activity and environment information displayed on a little digital display. As well as information on the likes of altitude, UV index, steps, calories and more the LCD display also dishes out some hybrid staples like notification support and activity tracking. A barrage of brands have made a real mess of adding a display into a watch in a way that impacts on the overall attractiveness of the watch. The AlpinerX is definitely an example of how the addition of a display has been executed well. It doesn’t dominate the watch face, but also has enough room to make it useful enough to view your data. As with all hybrids, the first challenge is to make a smartwatch that doesn’t actually look like a smartwatch. Alpina has been one of the most successful at pulling that off, but factoring in an LCD display does have the potential of breaking that illusion. Thankfully though, AlpinerX does a fine job merging those analogue and digital watch worlds. The confirmed AlpinerX 2019 models all centre around a fiber glass and stainless steel 45mm display – black on three models, blue on the other – with convex resistant sapphire crystal offering protection. The straps – a woven leather on two, a suede leather on one and black rubber on one – all feel expensive. These aren’t the crappy straps you find on a low-end running watch that’s trying to look smart. The twisty compass-themed bezel is another nice touch and its slender frame means it’s not a bulky one to wear either. This is of course a watch designed for rugged use and the stainless steel body is water resistant to 100m (10ATM). We’ve yet to test how robust and durable that watch body and screen is – there’s a reason rugged watches tend to look the way they do – but it certainly doesn’t feel as delicate as some Alpina’s other hybrid watches that we’ve had our hands on previously. That display is not a touchscreen, so your means of navigating the watch is via the three pushers on the right hand side of the watch. The middle one (the crown) does twist, but that action doesn’t unlock any features. Pressing it lets you activate the backlight for the display and scroll through the different data screens that are at your disposal. The pushers above and below activate sub-functions and sub-displays. There’s a surprising amount that can be viewed on the watch, so it will definitely pay off spending some time getting to know which pusher takes you to each data screen. 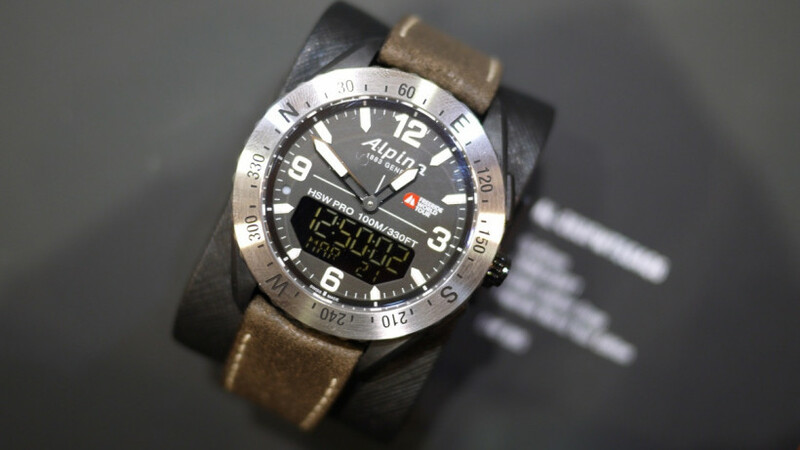 Alpina is pitching this as a hybrid smartwatch for people who like the great outdoors so it’s cramming in a lot of environmental sensors it thinks adventurers will find useful. It’s got sensors for temperature, altitude, pressure and UV index; all of which data can be viewed in real time on the watch with additional graphs viewable inside the companion smartphone app. It also wants to cover the navigation bases as well, but there’s some good and bad news on that front. The good is the ability to turn the watch into compass aligning the long hand towards north and the short hand towards south. The bad is that there is no onboard GPS – it’s just ‘Connected GPS’, so you’ll need your phone in the vicinity to track your location. What has been added, in terms of sporty smarts, is the ability to pair the X with a heart rate monitor using Bluetooth low energy and you can have your HRM data displayed on the digital display in real time too. This was one of the biggest requests from the Kickstarter campaign we’re told. Away from the outdoor features, it does offer activity tracking and sleep monitoring with the ability to track workouts (walking, running, Nordic and treadmill) from a sub-function on the watch. There’s also support for notifications with slight variations on what you can view depending on whether you’ve got it paired to an iPhone or Android smartphone. We shouldn’t forget about the timekeeping features with chronometer and WorldTimer modes on board and the ability to set smart alarms. The AlpinerX uses a revamped variation of the same Horological smartwatch platform as Alpina’s other hybrids. The focal point remains the main home screen where you can view data in three rings. A bit like the Activity Rings UI on the Apple Watch, but on the AlpinerX these represent your activity, sleep and coach. You can still set your steps and sleep tracking goals, there’s access to the Swiss Connect cloud platform to store your data and you’ll have access to the Dynamic Coach, which aims to offer tips and further insights into your health and fitness data. You can export that data to Apple Health and there’s a calendar to view your activity tracking progress over time. It’s clean, easy to get around and with the additional data provided from the environmental sensors, you can get that extra hit of data if you want. The AlpinerX is no doubt a looker and is one of the sleekest hybrid smartwatches we’ve had on our wrists for some time. Its success though surely lies with how well it works as an outdoor smartwatch which is something we’ve yet to really put to the test. While it’s great to have all of those environmental sensors on board and have the ability to view the data in real time with ease, the lack of built-in GPS feels like a big omission. No doubt its addition would impact on the slim form factor of the AlpinerX but it may well decrease its appeal for outdoor lovers. Compared to the likes of the, slightly cheaper, Garmin Fenix 5 Plus – which has a lot more more features, Alpina may have a hard task on its hands convincing someone to part with their cash to buy one. Although it’s much better looking than the Fenix. Alpina will be selling the 2019 AlpinerX models for 895 CHF, which is around $900. It will be available next month. Stay tuned for a full review on Wareable soon. Thanks for your visiting on this page Alpina AlpinerX 2019 edition doesn’t miss a beat thanks to Kickstarter feedback, We hope this post can be a good reference for you and provide useful information for you :-).